Most mainstream laptops are not made for gaming. They usually have integrated graphics chip that processes graphics, but with sub par performance compared to dedicated graphics cards. There are laptops that have a dedicated graphics card, but for thermal and power constraints are slightly lower in performance compared to their desktop counterparts. Playing games on battery power significantly reduces battery life due to the increased load on the CPU and graphics card/chip. For example a laptop runs about 6 hours when browsing the web but only get 1 to 2 hours when playing games. So it is best to game with the laptop plugged in to a power source. If you have a non-gaming laptop with integrated graphics it is recommended to see this guide: Onboard Graphics and set TS4 on Laptop Mode or lower the graphics settings in TS3. If you plan to game on a laptop, it is recommended that you get a laptop that is made for gaming. These types of laptops have a dedicated graphics card and a powerful CPU. However with a powerful hardware usually means that gaming laptops are much more expansive that a mainstream one with integrated graphics. You don't need to spend too much on it if you don't want to, just make sure your laptop graphics card is on the list of supported cards (see link below for chart on TS4 and TS3). The most inexpensive gaming laptop with a mid-range graphics card (such as an Nvidia GTX 1050) will be sufficient to play Sims games and cost about the same as a 2-in-1 convertible mainstream laptop. To check if your laptop can play Sims games: TS4 System Requirements and notebookcheck for The Sims 4 and TS3 System Requirements for The Sims 3. All gaming laptops have a dedicated graphics card and an integrated graphics chip for power savings. This graphics switching is done seamlessly with no screen blink. If you own a gaming laptop make sure your games use the dedicated graphics card. This is usually done automatically but if it does not, you may need to adjust it. 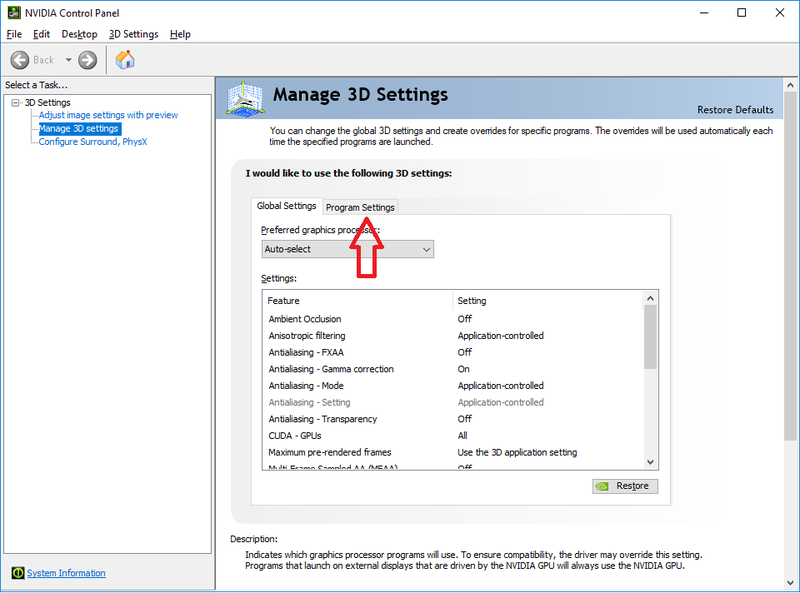 Below is a guide to get The Sims 4 running on the dedicated graphics card in an NVIDIA gaming laptop. 1. 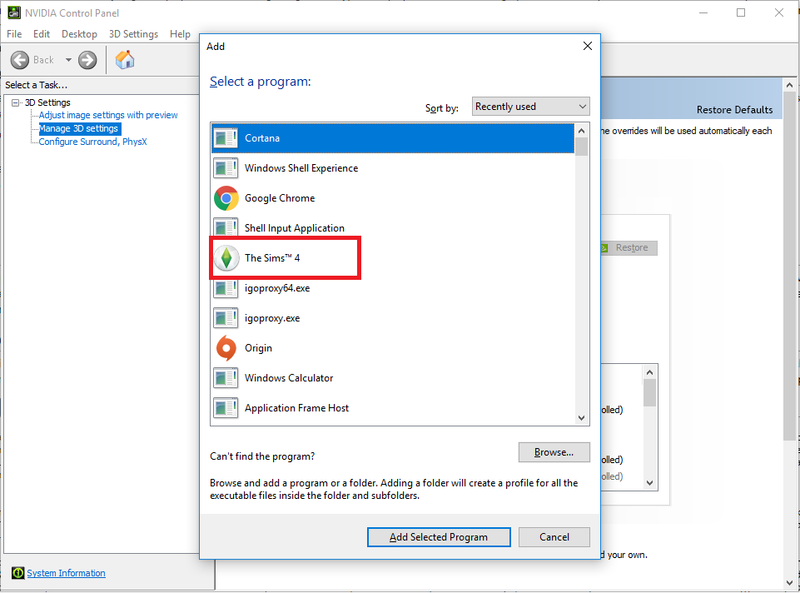 Right click on the Nvidia logo on the system tray and click on “NVIDIA Control Panel"
2. 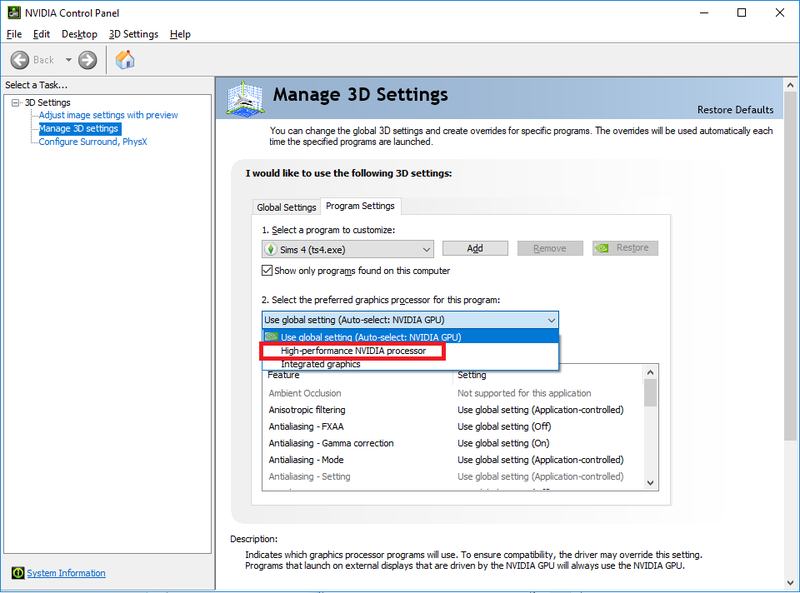 On the NVIDIA Control Pandel go to "Manage 3D Settings"
4. Select ts4.exe on the drop down menu. If the game is not listed, click "Add" and click on "The Sims 4"
The interface of laptops are different from a desktop. Instead of a mouse and keyboard laptops have a touchpad and keyboard. This is not a big issue if the laptop touchpad has dedicated buttons. However, newer laptop models (since 2013) and all Mac laptops have the touchpad as a button. This can be difficult to rotate the camera when playing Sims games on a laptop. However, there is a workaround to this problem, by holding the ctrl key and click drag by clicking on the lower right region of the touchpad (you may need to adjust the touchpad settings for it) on the touchpad will allow camera rotation. Another solution is to simply plug in a desktop mouse into a free USB port on the laptop. 2-in-1 laptops are laptops in addition to having a standard keyboard and touchpad, these models also have a touchscreen display and can be flipped to become a tablet. There are models with a detachable screen (such as Microsoft's Surface Pro line of 2-in-1s) However, most games including The Sims series games are not made to play with touch controls so make sure the display is docked to the keyboard when playing if you have a detachable laptop or rotate the screen to a standard laptop configuration. When it comes to upgrade components on a laptop, you are more limited in upgrading compared to a tower desktop as most components are soldered into the motherboard such as the CPU and graphics card. If you have a Mac laptop, you are even more limited in upgrading. Typically, a standard laptop has user replaceable RAM and storage with some models allowing for user-friendly CPU swapping. The same upgrade limitations also apply to All-In-One desktops (components that are directly behind the display). The newest mainstream laptops (since 2017) has a USB-C Thunderbolt port with the bandwidth of a PCI-E slot. This makes it possible to connect an external graphics card to a laptop with only integrated graphics allowing for desktop-level graphics performance. Some eGPU cases are modular, allowing for graphics card swapping. The disadvantage of external graphics cards is that it requires its own power source, reducing portability compared to a gaming laptop. This page was last modified on 15 January 2019, at 21:41.